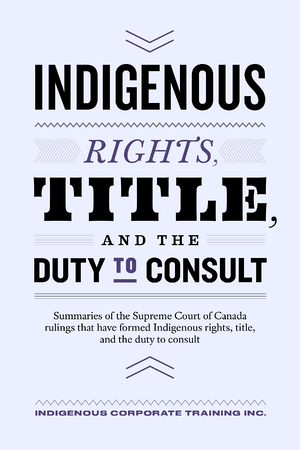 Do you know the key cases that define Aboriginal rights, title and the duty to consult? Aboriginal rights, title and the duty to consult are weighty topics that have been working through the courts for decades. Knowledge of the defining court cases is important when working with Indigenous Peoples but who has time to plow through long legal dissertations? Knowing that not many of us do have that sort of free time we took the foundational Supreme Court of Canada decisions and summarized them for you in this handy little eBook. Please share with colleagues, family and friends - we encourage you to do so because we believe that by sharing knowledge and information through our training, blog and free resources we can make the world a better place for Indigenous and non-Indigenous people.